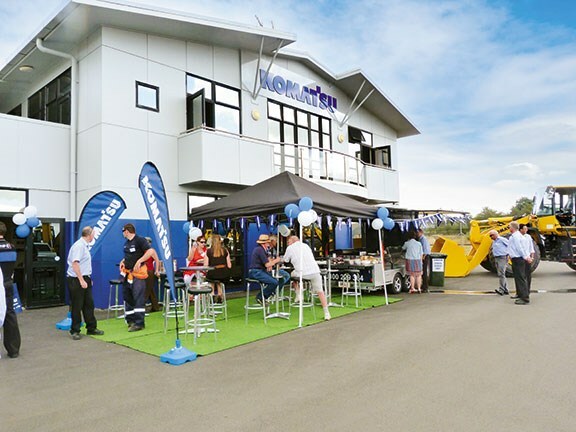 The Waikato city of Hamilton is no longer the sleepy hollow it was twenty-or-so years back, so responding to the needs of a rapidly expanding metropolis, Komatsu NZ has recently set up shop there and Deals on Wheels was invited along to share the food on offer at the official opening. The new branch is nestled right in the heart of all the comings and goings of the relatively new industrial subdivision at 12 Clow Place, just off Gallagher Drive in the suburb of Frankton, in what is rapidly becoming a prestigious new business development. 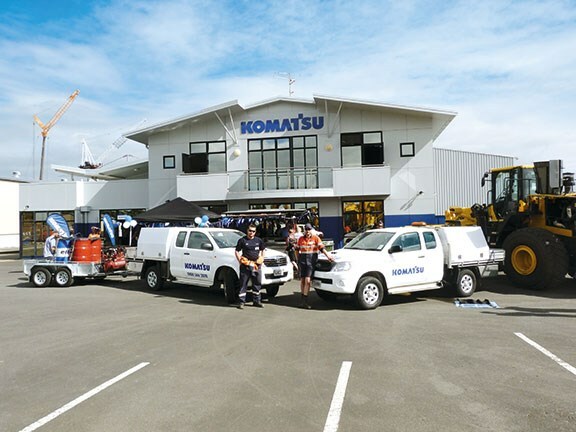 Waikato branch manager Robert (Bob) Hastie explained that the company identified the need to focus on the Komatsu product and customer base from a central location. "That's why we chose the Waikato region. This allows Komatsu to deliver improved customer support, with up-to-date parts sales and service," says Hastie. "We're proud of our new branch and we wanted to show it off, so we decided to have an open day where our customers could come in and have a look around, have a relaxed chat and something to eat," he says. In addition to Hastie, the new branch currently employs Tracey Holmes as customer support representative and two service technicians, and is supported by Les Reid, territory sales manager, and Tim Callaghan, business development manager — both with a part-time office in the branch. Looking around the large workshop with its three double service bays, it was clear it can service some of the larger construction equipment, such as PC450 excavators, WA500 loaders, D375 dozers, and HM400 trucks. There is also a large parts holding facility, and the Komatsu team has made sure there is a strong emphasis on health and safety throughout the branch to ensure a safe and efficient workplace. In the huge yard the team had set an impressive line-up of bright yellow excavators ranging from a three-tonne PC30 to a 45-tonne PC450, and a WA480 wheel loader, all of which attracted much attention from the constant flow of visitors. 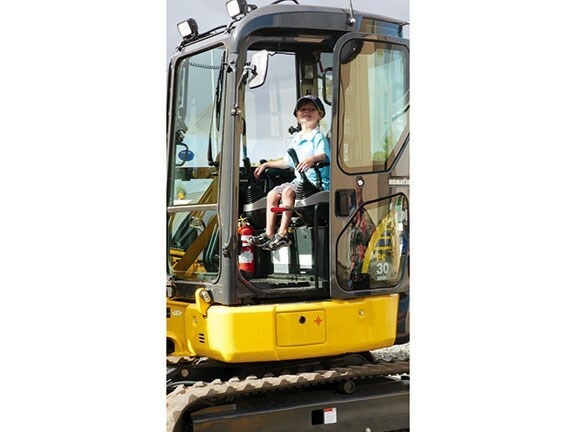 There was even a little bit of succession-planning going on in the form of four-year-old James Baker getting in some practice for later in life by checking out the controls of PC30 excavator. James is the son of Paul Baker, one of the two field service technicians. Baker senior shares his technician role with teammate Muir Schmidt and both men say they love their jobs. And with over 80 percent of their time in the field, they need the right tools for the job. 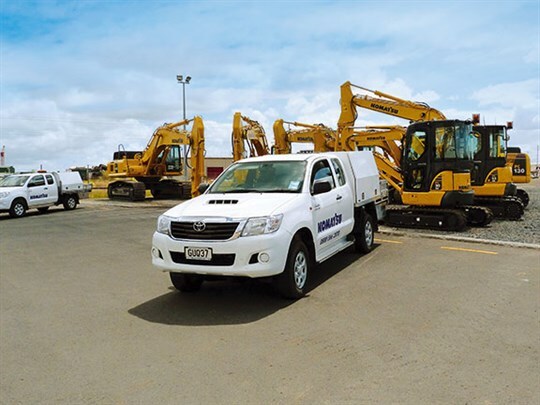 Their field service vehicles are equipped with all of the tools required to carry out even the largest of jobs, like engine changeovers on some older machines. And when it comes to doing an oil or hydraulic fluid change, the company trailer can be hitched up and towed to the jobsite. The trailer has been custom-fitted by the boys to carry four 200-litre drums, two of which are filled with whatever fluid is required for a particular job, while the other two are taken to the site empty, to be filled with the product being replaced to be taken back to the depot for recycling. Back at the workshop there is always a machine waiting to have its PDI (pre-delivery inspection) carried out. As part of the PDI, correct track rotation and hydraulic cycle times are thoroughly checked and logged, ensuring that when a machine is delivered to its new owner, it's ready for action, not to be seen again by the service crew until it's due for its first service at 250 hours. 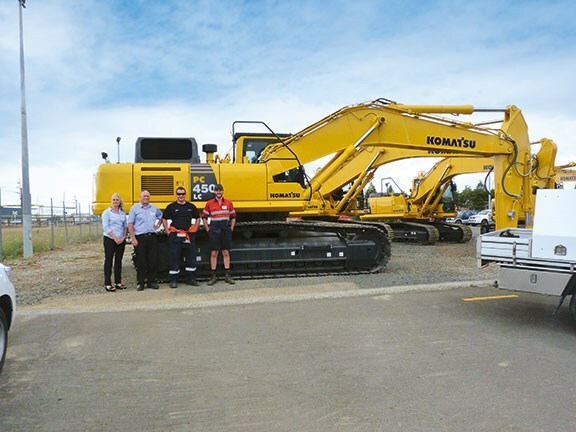 One person who is pleased Komatsu has opened the Waikato branch is Brad Pierce, general manager of Waikato Aggregates. He has a Komatsu 480 loader and a couple of 20-tonne Komatsu excavators in his fleet and he couldn't have been more complimentary about the service he receives from the guys and gals at Komatsu. Steadfast in his belief of the adage of having the best equipment and attracting the 'cream of the crop' of employees, Pierce says that while his operators enjoy the creature comforts afforded by Komatsu equipment, he is always pleased with the reliability of the machinery. The two hours I spent at the official opening flew by but there was just enough time to grab a snack and have a quick catch-up with Hastie (who had been flat out mixing and mingling the entire time) and Komatsu's Mike Gray of Komatsu corporate finance. The guys explained that Komatsu contains three business units, machinery, forestry and finance, and that the finance division was currently offering some pretty impressive deals to anybody purchasing Komatsu equipment this summer. For more information contact Komatsu New Zealand on 0800 KOMATSU of visit komatsu.co.nz.